McInness Mk 6 stretcher, Casualty Bag, Vacuum Mattress, LOTS splints, Medical Gases (Oxygen & Entonox) Defibrillator, Medical Drugs, Pulse Oximeter. The main first Aid Bags contain, in addition to some of the above, a wide variety of medical equipment and materials. 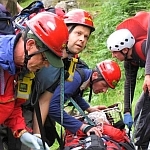 EMT's (Emergency Medical Technicians) carry supplemented first aid packs in addition to a cervical collar, lightweight oxygen cylinder, suction device and a selection of airways. 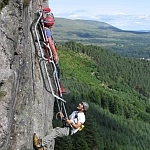 50m climbing & lowering ropes, 200m lowering ropes, Crag bags containing various Climbing hardware, Lowering and Belay gear, Dead men, Snow stakes, Avalanche probes, Harnesses, Bivi shelters, Pieps/BCA Trackers (Avalanche transceivers), GPS and Digital mapping. 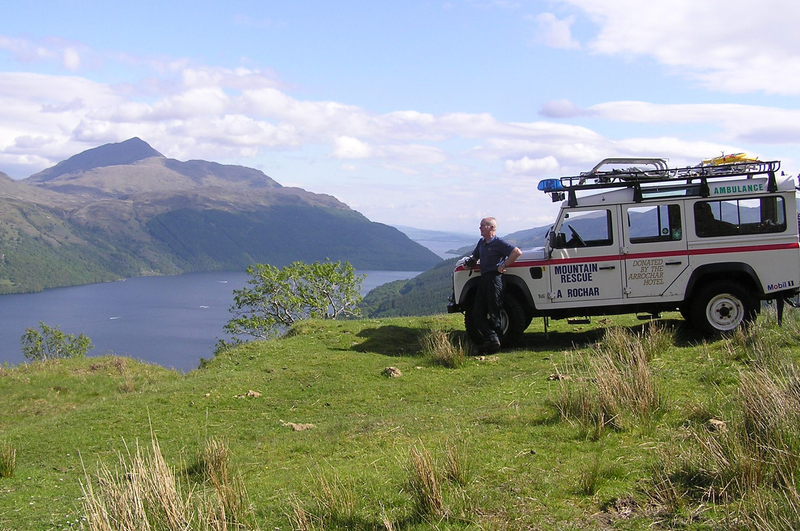 In 2005, after a period of consultation and testing, new radios and working frequencies (VHF) were allocated to all civilian MR teams in Scotland. These new radios are now part of the personal kit issue along with a spare battery and charger. A Repeater station can be deployed at a strategic position to aid communication effectiveness over rough terrain. The two vehicles are fitted with twin base radios. A base radio is also installed at the team post. AMRT own and operate 2 "Land Rover Defender" diesel station wagons. Vehicle 1, which is now retired was registered in 1994 and was supplied by North British Hotels Trust. 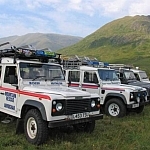 Vehicles 2 and 3 were supplied by the Order of St. John who also supplied vehicles to all the other civilian MR teams in Scotland. Each Land Rover is registered as an "Ambulance" and has functioning blue lights and sirens. The back seats fold down to enable the transport of a casualty on a stretcher if required. 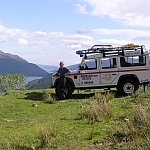 Each vehicle is fully fitted with identical equipment comprising of 2 radio base sets, roof-racks, First aid bag, Casualty Bag, Vacuum Mattress, Stretcher, Splints, Ropes, Crag Bag, Entonox, Oxygen, Defibrillator, Jump leads, snow chains, towrope & maps. In 2013 the team took delivery of a new command and control vehicle - also functioning as an Ambulance and supplied by the Order of St John, it is a very useful addition to the team.